Despite growing up in Singapore, I've always been deprived of TV. Pretty much yes. Not that we didn't have a TV. I was just really deprived of watching my kind of stuff on it. By the time I got addicted to cartoons, mom called up those cable services guys and got that channel removed. By the time I got onto MTV, she took away that too. So while my classmates were watching F.R.I.E.N.D.S and Malcom In The Middle and Desperate Housewives away, I was stuck with a mom who had monopolised the television set with Zee TV, Star Plus & Sony. Her monopoly still rules the house. But then again, she monopolises practically everything. None of this really matters. But I was just trying to show what a sad tragic deprived life I've had of catching awesome shows & movies from TV. And I love using hyperboles & emotional blackmail in vain attempts of getting public sympathy. That's why I've learnt from *cough*mom*cough*. Cos that's what she learnt from *cough*bakwassaasbahuserials*cough*. So anyways, it's only in the past few years that I caught up with that deprived life I missed out on. It's pointless for me to write on old legendary shows like Friends, Prison Break, Big Bang Theory. However, I can write about most recent shows I've come across that I find interesting. This show is one helluva show that gets your attention from the first episode. Just got released in June, it's first season's done with 10 episodes. 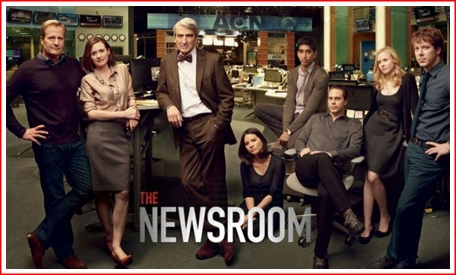 The show's all about The Newsroom. Quite literally. Focusing on US politics & world news from the eyes of an American reporter, it revolves around couple of folks who're driven to present news as objective as possible. Given how we live in the "Fox News" syndrome where everyone and everything is sensationalised,hoaxed even, Newsroom presents you a refreshing perspective on world issues. Moreover, it provides you with the inside scoop of how television news is produced. Yes, that means what goes behind the camera, the hardwork that a team of journalists have to do, the producers' job and of course, the entangled lovesexbooze life of all of them. The show's a brilliant concept with perfect execution. From the screenplay to dialogues to direction and scripting, they Aaron Sorkin's nailed it with this series! Character detailing of the lead protagonists Will McAvoy(Jeff Daniels) & MacKenzie McHale(Emily Mortimer) together with the supporting cast has been well-dealt. I am really looking forward to its next season due some time in 2013. If you're pursuing journalism or mass comm, this show's a must-must-watch for you. It's like your bible. It's the sort of stuff they won't really teach you in school. Thanks to be the Gods for my awesome friends who introduce me to such shows & doubly-thanks to be the Gods who showed that man who came up with torrents & piracy. Thanks you Gods for showing us the light at that end of the monopolized-tv-set-dark-tunnel.